In late July, I visited Washington, D.C. My first purpose there was to visit a friend from college but somewhere along the way, during the initial planning process, I encountered Athena and decided that my second purpose would be to seek her out in the art of the Polis. For those who do not know, many key federal buildings in Washington, D.C. were built in a neoclassical style, a return to ancient Greek and Roman (especially Roman) architectural and artistic conventions. Naturally, I could not resist the opportunity to tour some key places in DC with my Pagan eye wide open (and take pictures to document the experience!). To be honest, I was more stimulated by the neoclassical architecture than I expected to be. Plus classical mythology references were everywhere, from the sculptures to the reliefs to the paintings! 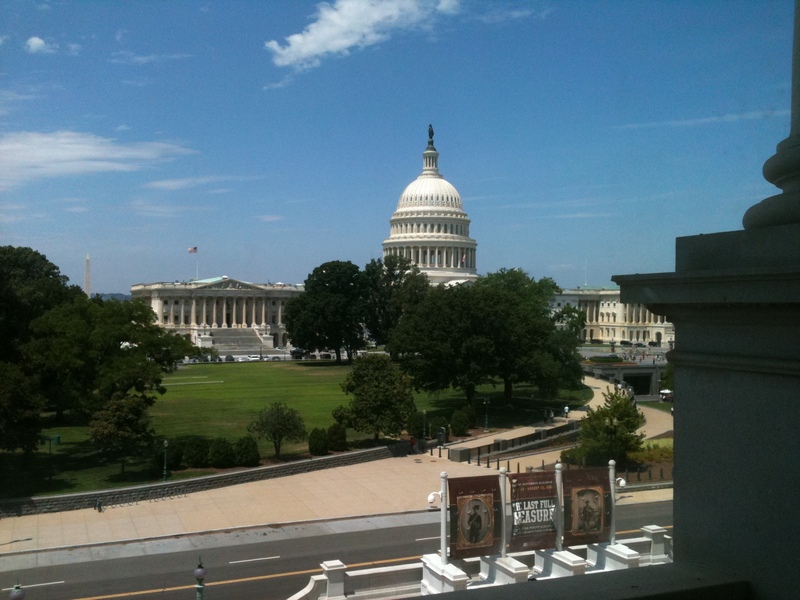 During my time in the nation’s capitol city, I took in a few memorials, two Smithsonian Museums, the U.S. Library of Congress, and the U.S. Capitol Building, but the Library and the Capitol were the coolest of the places I visited, in my Pagan opinion. Images of the gods are all over those two buildings! 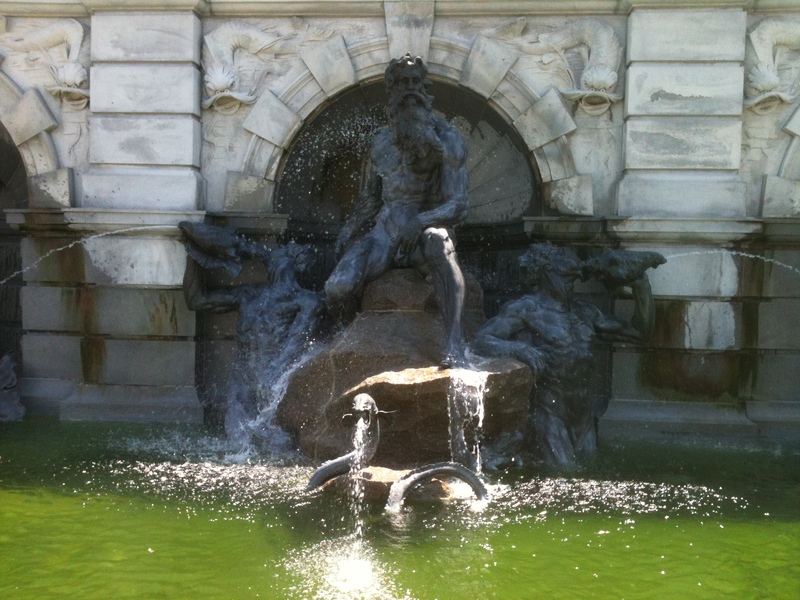 The fountain outside of the Library of Congress features Poseidon-Neptune and the Waves. 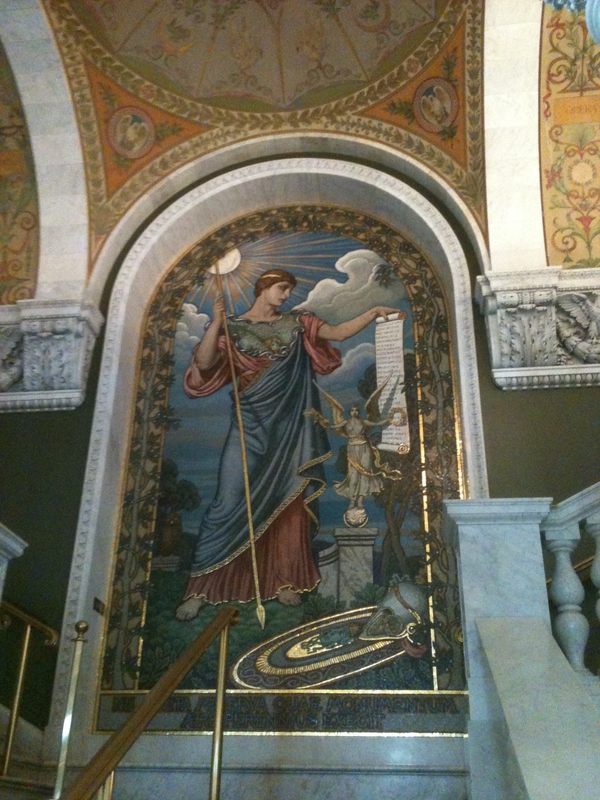 Inside the Library, at the entrance, are Athena-Minerva of War and of Peace. War is armed, peace of course is not. Those pieces belong to Athena-Minerva more so in name. Precious little of their iconography and even less of their bearing speak of her. With regard to their bearing in particular, they are much more delicate and feminine than most popular classical depictions of Athena-Minerva. On the second floor are the eight Virtues who grace the four corners of the Great Hall. Many of them were vaguely reminiscent of Athena-Minerva from my perspective, particularly Courage, Fortitude, Industry, and Prudence. The resemblance was partially (and barely) borne out in their iconography (i.e., some weapons, spindle, and distaff) but also in what they stand for, the abstract ideas that they represent. Like War and Peace, the Virtues were very feminine, but then again, they are not named after Athena-Minerva so I cannot fault them for being less like her than I would have hoped. The full-color, absolutely gorgeous mosaic of Athena-Minerva complete with spear, shield, helmet, breastplate, owl, olive tree, laurel, and Nike-Victoria was the complete opposite of the other Athena-Minerva-like pieces. Not only does it bear her name but it is true to popular classical images of the goddess. It looked like it was taken straight from a wall in Pompeii (of course I say this as someone who is not at all a trained scholar on ancient Roman architecture and art). I stood in awe for at least five minutes, taking it all in. My next stop was the U.S. Capitol Building. When I researched what to see in DC related to Athena-Minerva a week or so prior to my trip, most results were for sights in the Library of Congress, but the Statue of Freedom which tops the dome of the Capitol Building also has some Athena-Minerva influences. Really, any martial neoclassical female (but not necessarily feminine) figure will probably make the average Pagan think of Athena-Minerva, and the Statue of Freedom was no exception. 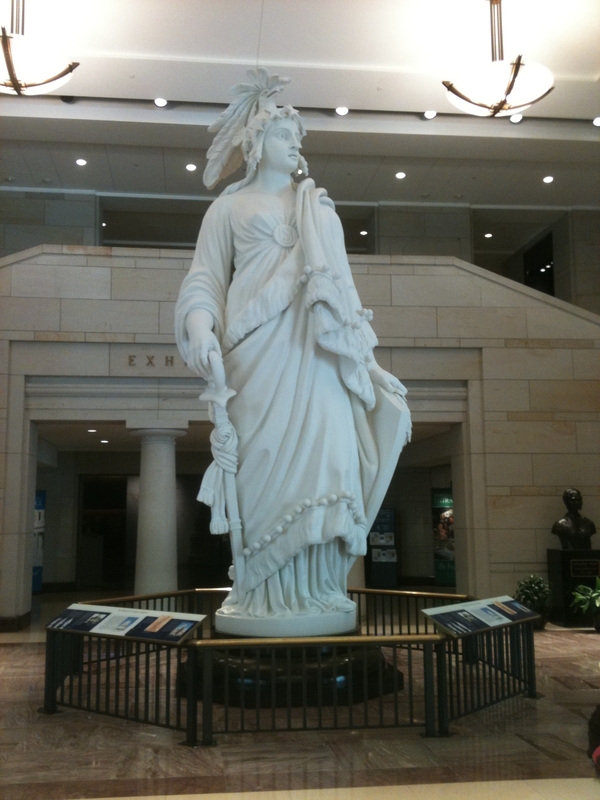 The replica of the Statue of Freedom in the Capitol Building Visitor Center lobby offered an opportunity for closer inspection of her iconography. Although she is obviously an United States symbol (and some would argue a problematic one), her Athena-Minerva heritage is revealed by her helmet and shield, and in the fact that she is armed. Although the items themselves partially characterize classical images of Athena-Minerva, the details were altered for the Statue of Freedom to uniquely represent the United States of America (e.g., stripes on the shield representing the original states instead of the head of Medusa). Regardless, I saw Athena in the Statue of Freedom and so I purchased a couple of inexpensive postcards depicting the Statue. 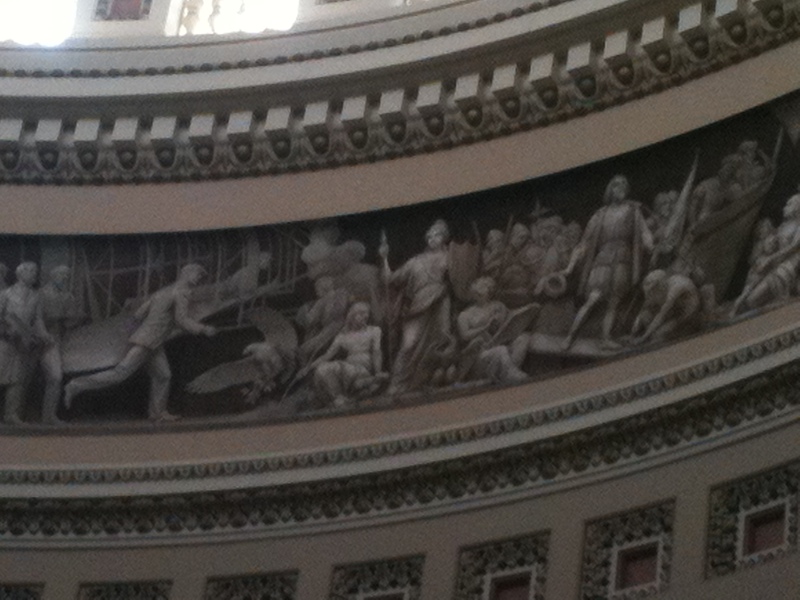 I also took a guided tour of the Capitol Building, after studying the Statue of Freedom replica in the visitors’ lobby. Most of the tour was interesting but did not raise my Pagan eyebrow. It was not until we visited the Rotunda and I looked up at the Capitol Building’s dome that my Pagan eyebrow nearly raised clean off my face. The Apotheosis of Washington. Nuff said for those who have seen/read about it. For those that have not, let me elaborate. It is basically a romantic neoclassical depiction of Washington’s imagined elevation to godly status elegantly rendered on the dome (which is just below the actual bronze Statue of Freedom that tops the building). In the painting, Washington is surrounded by the Greco-Roman gods. Athena-Minerva is present as a patroness of Science. She teaches and offers guidance to some of the greatest thinkers of that day. Poseidon-Neptune, Aphrodite-Venus, Hermes-Mercury, and Demeter-Ceres are also featured. Hephaistos-Vulcan even appears in the piece to represent Mechanics in the founding of the country. I actually did not see him while I was physically there in the Rotunda. It was not until I got home and examined the photo I took that I saw the head of another figure, did some research, and found out that it was Hephaistos-Vulcan. He and Athena-Minerva are depicted directly opposite one another; consequently, only one can be seen at a time, depending on where you are standing in the Rotunda. 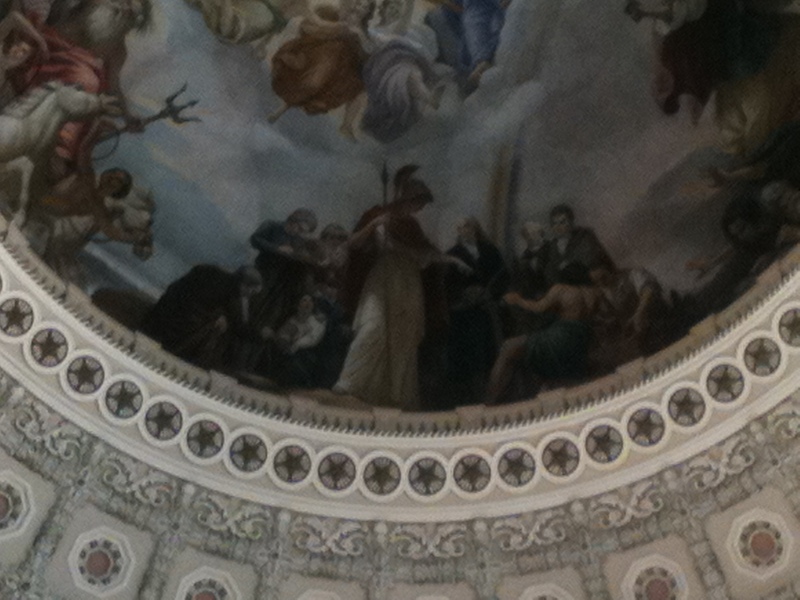 In addition to Athena-Minerva (and Hephaistos-Vulcan) in the Apotheosis, there is also a depiction of Athena-Minerva in the frieze just below the dome/Apotheosis painting. 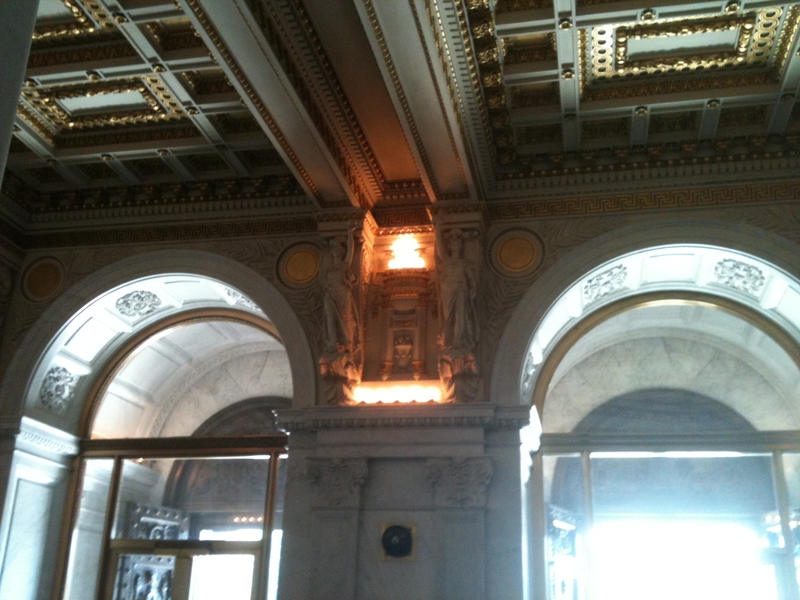 In that highly central room of the Capitol Building, Athena-Minerva is literally stacked on top of herself. She is reflected to some degree in the Statue of Freedom then depicted true to classical form in the Apotheosis decorating the inside of the dome and then again true to ancient form in the frieze just below that. As a Pagan in the Polis – the capitol city of the United States – I thought that was mighty cool! In each depiction, Athena is framed as an important goddess of state, honored as an ancient patroness of the polis. She is also presented as a key intellectual and moral resource for the formation of a powerful, successful, and just state. I am not making claims about what the U.S. is or is not in reality, only what it aspired to be at the time Washington and others were laying plans for the capitol city. Whatever the reality may be, I will say that while walking through DC I was inspired by Athena’s “presence” there, even if it was primarily iconographic. Specifically I was inspired by the high ideals, reason, and hard work of crafting/building that she embodies. Being in DC to honor her also helped me to see the glory in at least attempting to contribute one’s best to a society/culture (which I understand as broader than one’s city-state). The funk I have been in lately has made it hard for me to find value in the work of my hands, or in my case the work of my mind, but both really are Athena’s kind of work and the more principled and purposeful the work is, all the better. In a nutshell, my time in DC helped me to start seeing the value in my work again and the importance of contributing to something greater, whatever that may mean to the individual and her community. Glory to Athena! I give thanks to Polias (She of the City) and Oxyderkês (the Sharp-Sighted One) for the insights gained during my time in Washington, D.C. and to Ergane (the Worker) for helping me to regain my confidence and sense of meaning in my work. This entry was posted in Deity Information, Labyrinth and tagged Deities, District of Columbia, Epithets, God Hephaistos, Goddess Athena, Washington DC by Wandering Woman. Bookmark the permalink. The photos you took are a lot of fun. I especially liked the Minervas of War and Peace. Did you know that was there and seek it out, or did you stumble upon it ? Ah, grey-eyed Athena – Glory to You ! I stumbled upon her. 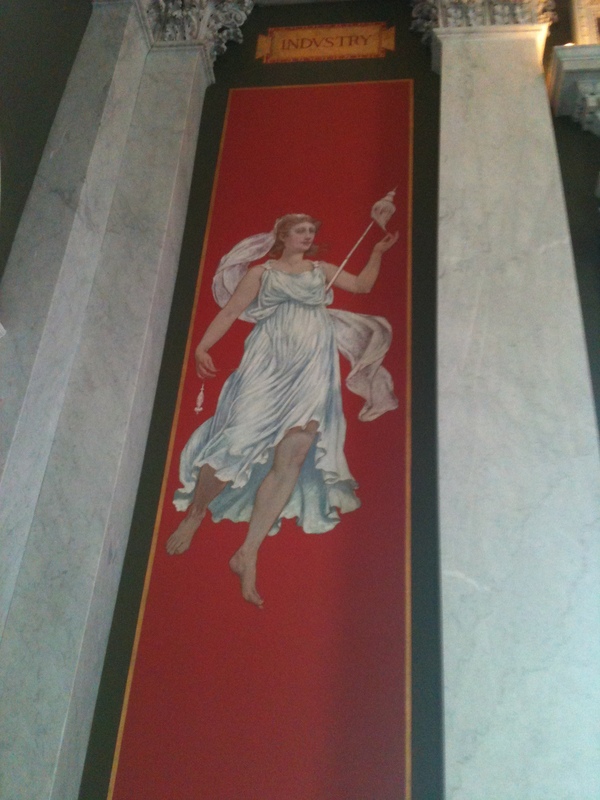 It was so fun finding such strong Pagan themes in the Capitol! Hail Athena! Hail Minerva! Hail Columbia! 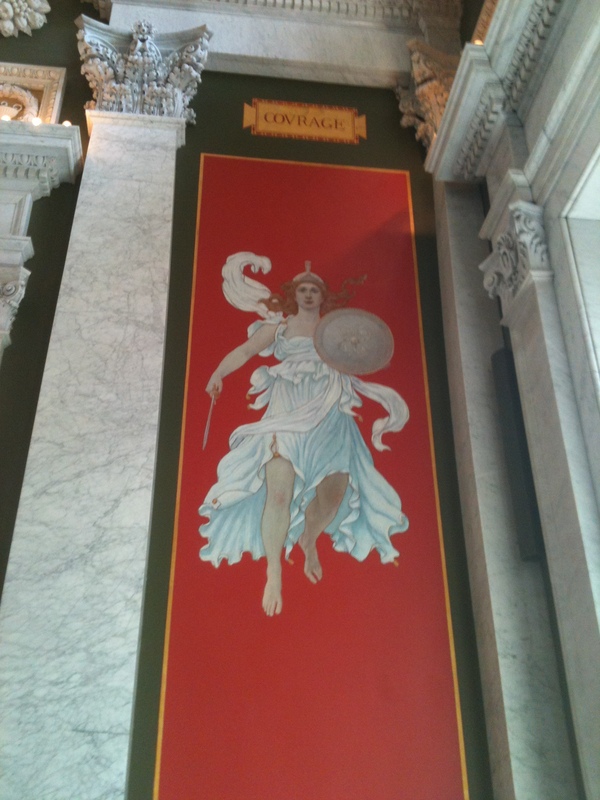 According to the Architect of the Capitol’s website, it’s Minerva aka Athena among the Greeks. 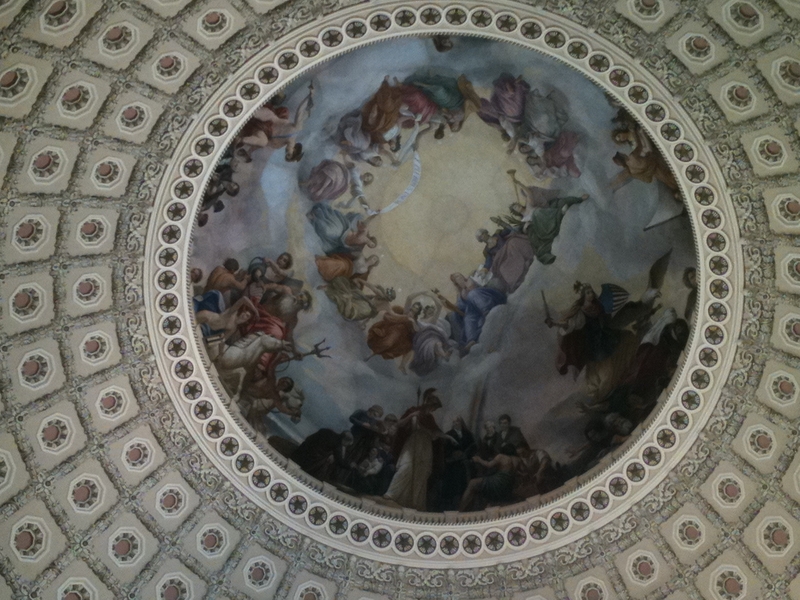 Check it out here: http://www.aoc.gov/cc/art/rotunda/apotheosis/Overview.cfm. Did you not see the sculpture of Washington in the Museum of American History, where he’s seated on a throne, got a body like a Greek god, is wearing a toga and is pointing to the sky with one hand and extending a sword with the other? It’s quite startling indeed. Wow! Thank you for posting those amazing pictures! I didn’t not know about the Apotheosis of Washington. If I am ever in D.C. again, I will make it a point to stop there and view the art in person. 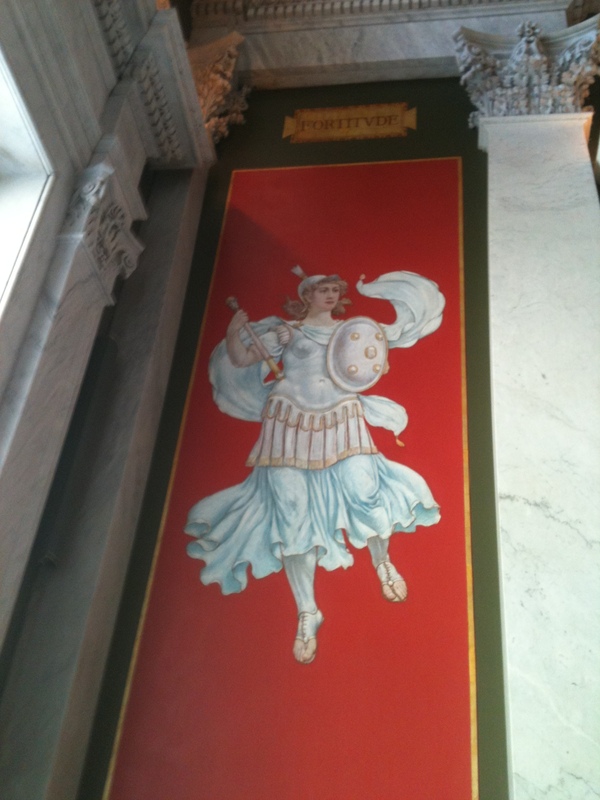 Also, Athena’s presence in our nation’s capitol makes me wonder if particular gods have a marked presence (patronage?) in other major cities in the U.S. (I suppose that’s a very “American Gods” sort of question). For many, ancient history and classical mythology represent a romantic ideal, which is what I think appealed to the architects of DC. The builders of the capitol and of the nation itself could make the city grand by aligning it architecturally and artistically with Greco-Roman cultures, the very societies that stand as pillars of civilization in the social and political imagination of many. From this romantic and idealized standpoint, the Gods are reduced to symbols, mere personifications of the abstract ideas and principles on which the founders hoped to build a new society/civilization. That was all the Gods could be in a nation built physically and intellectually by Christians (at least in the nation’s early years). I think that the Apotheosis is the greatest testament to my point here. Washington has the position of Zeus in the fresco! Washington is presented as chief of the gods, first among the abstracted personifications. Washington-Zeus serves as the embodiment of what the United States of America might rise to be, that is master of science, mechanics, commerce, beacon of Freedom and liberty, and chief of the other abstract ideas represented there. Really, Washington is being idealized, and the nation along with him so much as he serves as a proxy. I do not feel he is being deified, mainly because there are rules against that in Christendom and I doubt a fresco in the dome of the capitol would have been allowed to exist in that day and age if there was even a sneaking suspicion that such blasphemy were taking place. A genteel lady or seven would have passed out right there in the Rotunda, more than a few righteous men would have quickly followed…much to their embarrassment. Sorry. I was ranting. More to your point, Lady of Bones: As problematic as the romanticized artistic depictions of the Gods are for someone who knows the Gods to be real beings, it was still very exciting to see them winking an eye and flashing a smile among the nation’s building blocks. Who knows. I would not doubt that they do indeed show their faces in the state buildings of other major cities! Tamilia, what convinces you that the people responsible for creating so many buildings, statues, and paintings dedicated to ancient gods were christian? SSSHHH!!!! Don’t let the Christian right “hear” you.